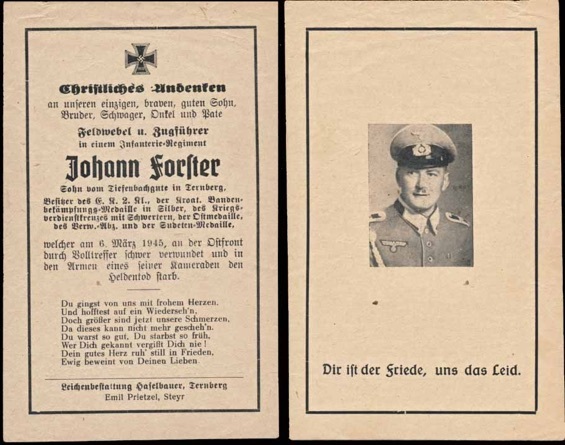 WW2 German Death Card (Sterbebild) for Army Feldwebel and Platoon Leader Johann Forster, Infantry Regiment. Was awarded the Iron Cross 2nd Class, Anti-Partisan Badge in Silver, War Service Cross with swords, Russian Front Medal, Czech Anschluss Medal and Wound Badge. Badly wounded in the arms by a mortar and died on the East Front, 6 March 1944. The single page double sided card measures about 2.75 x 4.5 inches. In good condition, showing very slight age. 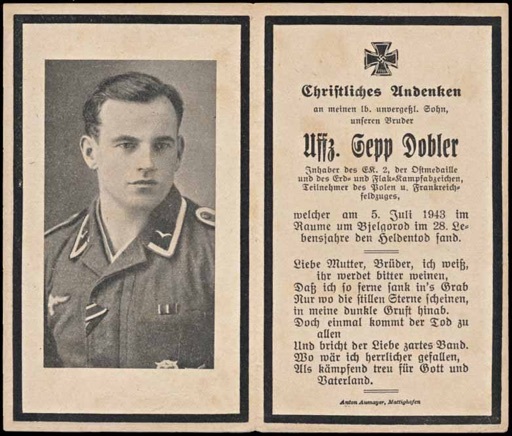 WW2 German Death Card (Sterbebild) for Luftwaffe Unteroffizier Sepp Dobler. Was awarded the Iron Cross 2nd Class, Russian Front Medal, Luftwaffe Ground Combat Badge and Luftwaffe Flak Badge. Participated in the campaigns in Poland and France. Killed in the area of Bjelgorod, 5 July 1943. He was 28. Back of the card has a rendering of his grave. The double page single sided card measures about 5.5 x 4.5 inches. 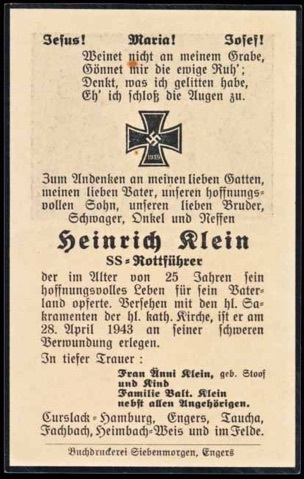 WW2 German Death Card (Sterbebild) for Waffen-SS Rottenführer Heinrich Klein. The single page single sided card measures about 2.5 x 4.5 inches. Includes a German Graves Office slip listing him as dieing in Lublin Reserve Hospital and buried in Pulawy, Poland. 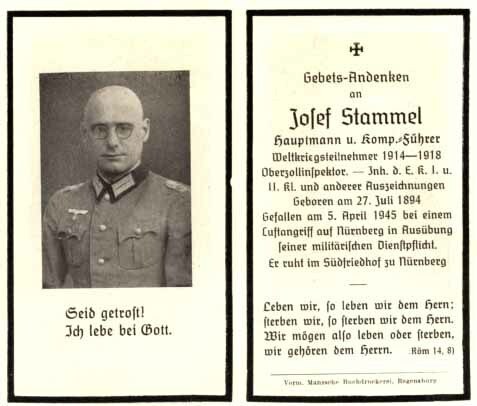 WW2 German Death Card (Sterbebild) for Army Hauptmann and Company Commander Josef Stammel. Participated in WW1. Was awarded the Iron Cross 2nd Class, Iron Cross 1st Class and many more medals. Killed in the aerial attack on Nuernberg, 5 April 1945. He was laid to rest in the South Cemetery, Nürnberg. Single sided double page card measures about 4.75 x 4.25 inches. 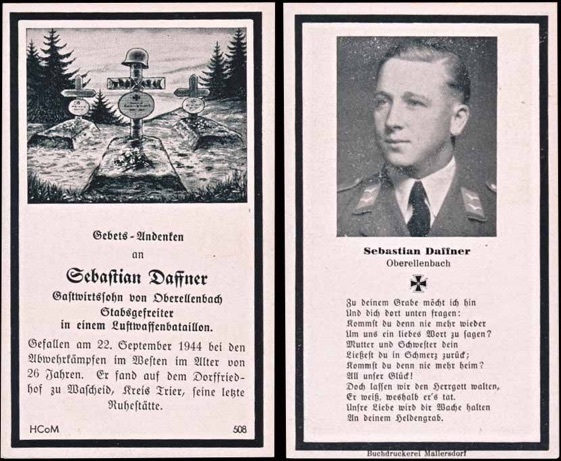 WW2 German Death Card (Sterbebild) for Luftwaffe Stabsgefreiter Sebastian Daffner, Luftwaffe Bataillon. From Oberellenbach. Killed 22 September 1944, repulsing the enemy in the West. He was 26. He was buried in Dorfried by Walscheid in Kreis Trier. Double sided single page card measures about 4.5 x 2.5 inches. 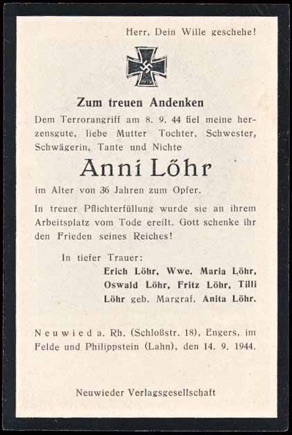 WW2 German Death Card (Sterbebild) for Anni Lohr. Killed in an aerial assault on Neuwied, 8 September 1944. She was 36. Back of card has a rendering baby Jesus. Single sided single page card measures about 2.5 x 4.25 inches. Includes a slip from the German Graves Office that she was buried in the military cemetery in Neuwied. 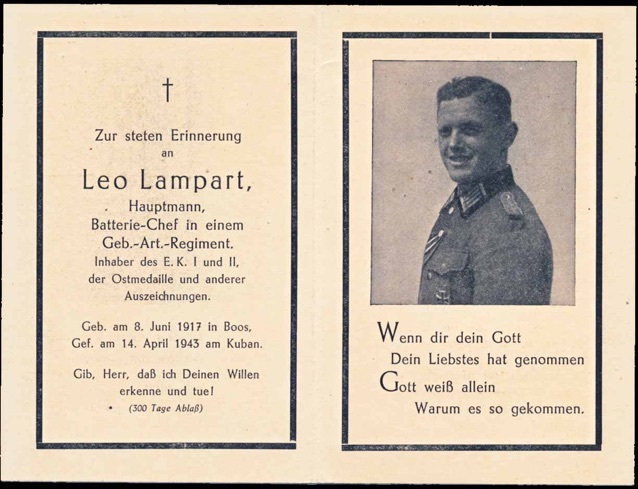 WW2 German Death Card (Sterbebild) for Army Hauptmann and Battery Chief Leo Lampart, Gebrigs Artillery Regiment. Was awarded the Iron Cross 2nd Class, Iron Cross 1st Class, Russian Front Medal and many more medals. He was killed on Kuban, 14 April 1943. Nice officer photo with the Iron Cross 1st on his tunic. Single sided double page card measures about 5 x 6.5 inches. Back of card has an Iron Cross. Includes German Graves Office slip listing him as killed in Krymskaja and buried in Krymsk, Russia.